This morning EJ and I went to the store. EJ had to pick up some prescriptions, I bought some vitamins, and I also bought 12 gallons of water. Our water in our village is not all that great so we buy water for drinking and cooking whenever we go to the store. Frequently, a stranger (usually a woman) will see the gallons of jugs in my car and say, “Did you know that you can fill empty jugs at the station at the back of the store? It’s cheaper than buying them off the shelf.” It’s not all that much cheaper and I don’t want to take the time to fill all those jugs. Since it’s never the same person twice and I know that they are simple trying to be helpful, I usually just smile and reply that I’m aware of it. But inside I think, “Why do people feel they need to comment on the contents of another person’s shopping cart? Sheeesh!” Sometimes I fantasize about fastening a sign on my cart that says “I know refills are cheaper, but I prefer not to fill all these jugs.” But I never do that. I just smile. After EJ left for work, I took Danny for his daily walk. 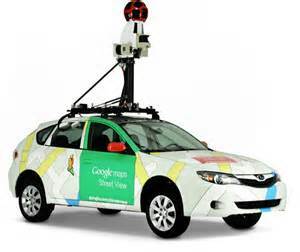 We had just begun our walk when the Google Maps Street View Car drove by. A little bit later, it drove by us again. I was so surprised. Maybe Danny and I will be on Google Maps….twice! Wouldn’t that be funny? I’m not sure I looked good enough to be immortalized on Google Maps, but at least I tried to make sure Danny wasn’t pooping or anything when the car passed. When we got back home. I mowed the lawn. The lawn mower started and it didn’t quit on me. YAY! Now the lawn looks tidy and pretty. I love a freshly mowed lawn. The other day a friend brought us some zucchini from his garden. I am thinking of using the zucchini to make a mock apple pie. And/or maybe I will make zucchini bread. Maybe I will make it today. Or maybe tomorrow. While I decide, I will go do some laundry and wash some dishes. Oh that mock apple pie makes me laugh. I took that to a 4-H event once, and after I started laughing about the apple pie compliments someone caught on. It was great!